The Convex Mirror Shop is an online shop for the complete range of Acril Convex Mirrors. Acril Convex Mirrors are considered the very best with a reputation for quality, excellent design and competitive pricing. 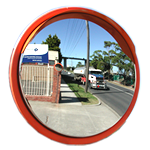 Our range of mirrors are manufactured here in Australia or New Zealand not Asia; you can be assured that the complete range on offer is of the very highest build quality. They are impact and UV resistant and the advanced mirror and shaping techniques ensures a reflection that gives clear, undistorted images. Mirror surfaces, depth of curvatures and associated fittings have been specifically engineered to out perform lesser quality mirrors and provide optimum characteristics for the intended application. All images on this site are a true representation of the product including the mirror reflection, not enhanced nor altered. Any comparision of our mirrors will quickly prove the value and benefits of our products and with no Australian standards regulating convex mirrors of this type and classification a large range of varying product quality is unfortunately finding its way onto the market. We guarantee our mirrors are made to the very highest quality and urge you to not just compare price but also the quality and construction on offer. The Acril Convex range of mirrors include various dome mirrors, convex mirrors, traffic mirrors in both acrylic and stainless steel, wall and post mounted styles, specialist inspection mirrors, flat factory mirrors and much more. They are ideal for monitoring and observing difficult or hazardous areas, allow safe movement of people or product and provide a very practical and cost effective solution to increasing overall awareness and visibilty. Our mirror sizes range from 150mm up 1200mm diameters. For more information visit the Acril Convex Website. The Convex Mirror Shop services Australian locations only. WHICH MIRROR IS RIGHT FOR ME? Use the "Help Me Choose" application to help you select the correct mirror for its intended environment. Our dome and half dome mirrors have been designed with varying depths of curvature to maximise the image quality across all styles. Full dome mirrors require a deep curvature to provide the wider field of view whereas half domes must have a reduced curvature to maximise definition. Unlike our competitors, our half domes are not simply a full dome cut in half and provide a far superior image in all respects.